This model includes OneTouch AT Network Assistant with the Copper/Fiber LAN option, includes module and test frame, frame carry strap, AC adapter and line cord, wiremap adapter #1, RJ45 coupler, RJ45 patch cable, accessories pouch, carrying case, getting started guide, and resource CD with user manual. Troubleshoot copper, fiber optic and Wi-Fi network problems from a client device to cloud-hosted applications and everything in between - even when you are not there. 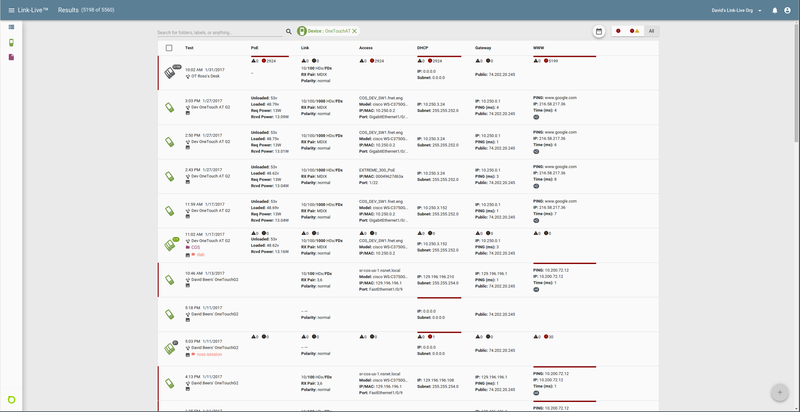 Troubleshoot persistent network problems and validate network performance on-site in real-time. Troubleshoot intermittent network problems and identify vulnerabilities by automatically uploading results to the cloud for web-based performance trending and root cause analysis. By improving each step of the process, the OneTouch AT helps novice and expert network technicians solve more problems faster, escalate issues more efficiently and validate performance easily - saving up to a week of time each month. Be ready for a broad range of troubleshooting scenarios with the handheld OneTouch AT G2 Network Assistant. The tester incorporates dual copper and fiber optic test ports to facilitate troubleshooting of 10/100/1000Mbps twisted pair and 100/1000Mbps fiber topic Ethernet networks. The dual ports simplify inline packet capture and VoIP monitoring by eliminating the need for mirror ports or Taps. For troubleshooting Wi-Fi networks the OneTouch AT tester incorporates an 802.11ac dual-band Wi-Fi radio with a 3x3 antenna. 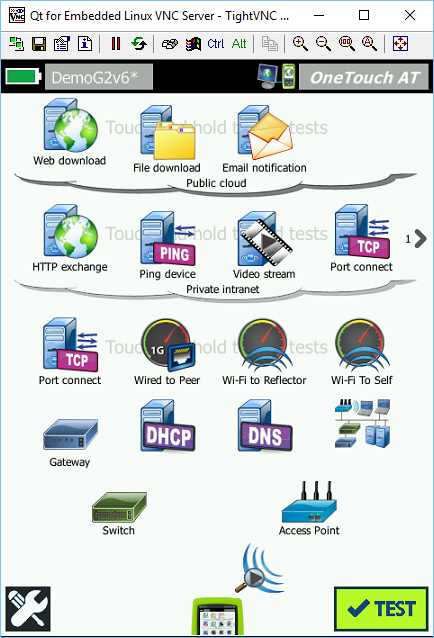 When connected to both wired and Wi-Fi networks the tester displays test results side-by-side on a single page to aid in problem domain isolation. The OneTouch AT Network Assistant has a modular design. A 10G module is available for testing wired 100Mbps to 10Gbps Ethernet switch port and link performance at up to 10Gbps rate. 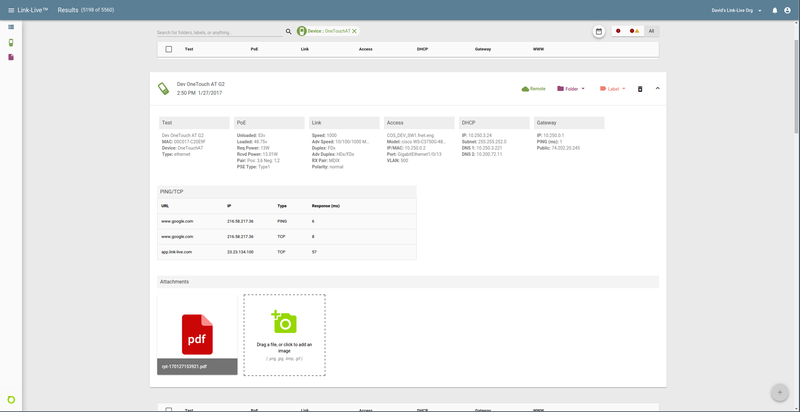 Use the intuitive touch interface and the Setup Wizard to create test profiles, where a profile is a set of tests tailored to your network, services, and applications. Create simple profiles with only a few tests or advanced profiles consisting of dozens of tests. You can build profiles to accommodate different types of users, devices, locations or technologies. Once created, profiles can be saved for quick and easy reuse later. Create a library of standardized profiles to elevate the troubleshooting know-how of network support staff. Share profiles with other OneTouch AT users. Use profiles to establish best practices for consistent, faster, more productive troubleshooting and network acceptance testing. Simplify profile creation while learning about the tester’s capabilities by running the Setup Wizard. The wizard simplifies profile creation with step-by-step guided instructions, yes/no prompts, on-screen help and graphical progress indicators. Experienced users can bypass the wizard if desired. Test everything defined in a profile automatically with the one-touch AutoTest. The AutoTest progresses from the physical layer of the network, through the wired and wireless infrastructure, to network services and user-defined applications tests. Clear pass/fail and warning indicators highlight potential problems. A top-level pass/fail indicator provides the overall AutoTest status at a glance. Understand how a client device connects to the wired infrastructure by testing link negotiation, identifying the nearest switch, and monitoring key switch port statistics. The OneTouch AT with G2 Module tests IEEE 802.11a, .11b, .11g, .11n and .11ac Wi-Fi networks. 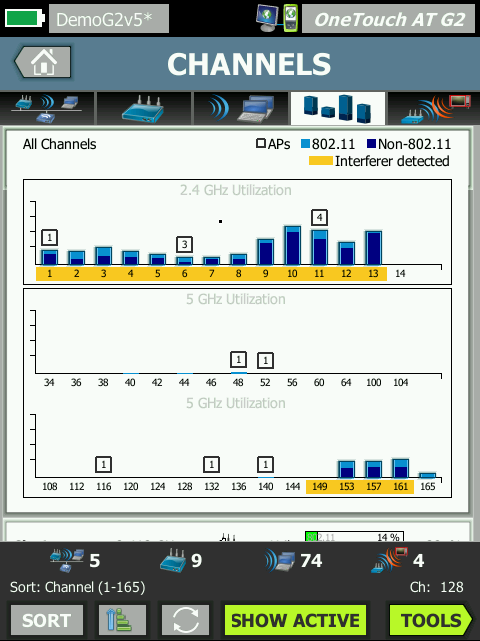 It shows understand how a client device connects to the Wi-Fi infrastructure by testing the link between the client and the nearest access point, identifying the AP name, channel and security type, observing the authentication and association process, and monitoring key AP and network statistics, including roaming details by AP. For Wired client, the OneTouch AT with G2 Module tests 10/100/1000BASE-T twisted pair and 100BASE-FX/1000BASE-X fiber optic Ethernet networks, while the OneTouch AT with 10G Module test RJ-45 test port for 100/1000/10GBASE-T and 1000 BASE-X SFP/10 G BASE-SR/LR SFP+ Ethernet over optical fiber Network. Test DHCP server responsiveness. Identify the wired and Wi-Fi DHCP servers and view the offer and acceptance timing and lease information. 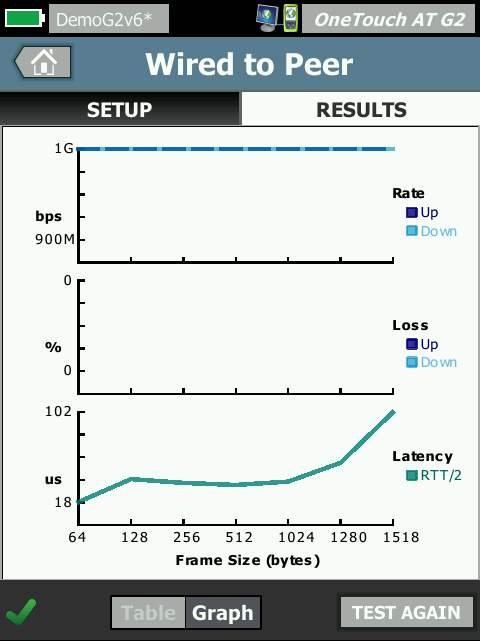 Test DNS server responsiveness. 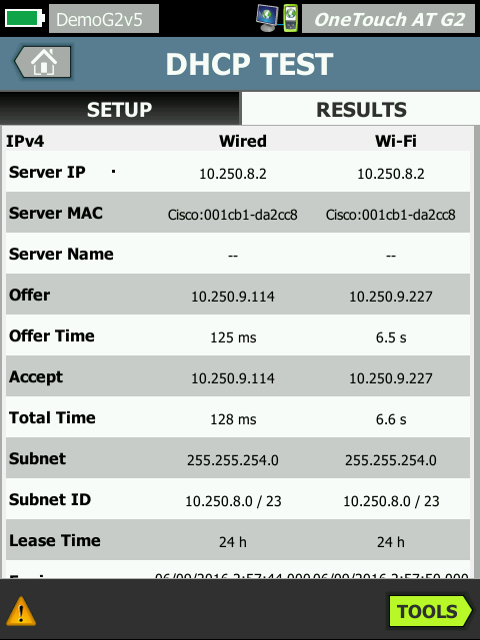 Identify the wired and Wi-Fi DNS servers and view the DNS lookup time. Determine if a server-based application is the root cause of a reported problem by measuring availability and responsiveness metrics. 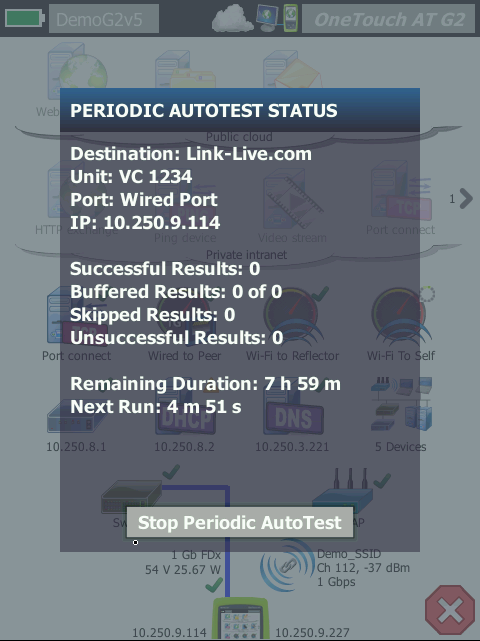 Add to the AutoTest profile the performance test appropriate for the application: ping (ICMP), connect (TCP), web (HTTP), file (FTP), multicast (IGMP), video (RTSP) or email (SMTP). Each test is graphically represented on the OneTouch AT home page as an icon. After running the AutoTest, touch a test icon on the home page to get a detailed breakdown of application performance including DNS lookup time, server response time and data rate. 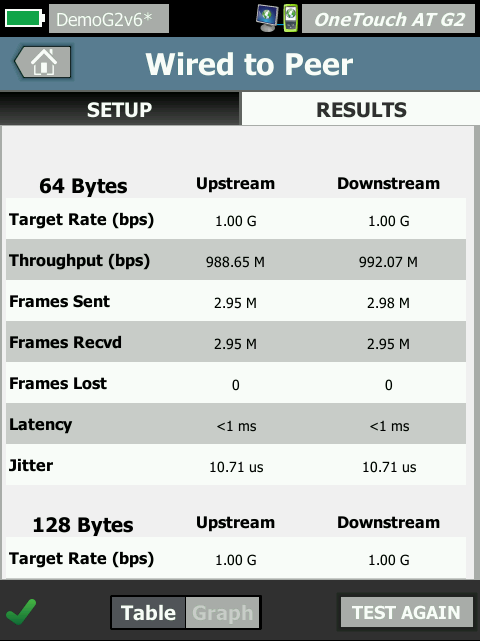 The test results are presented side-by-side for easy wired/Wi-Fi and IPv4/IPv6 performance comparisons. 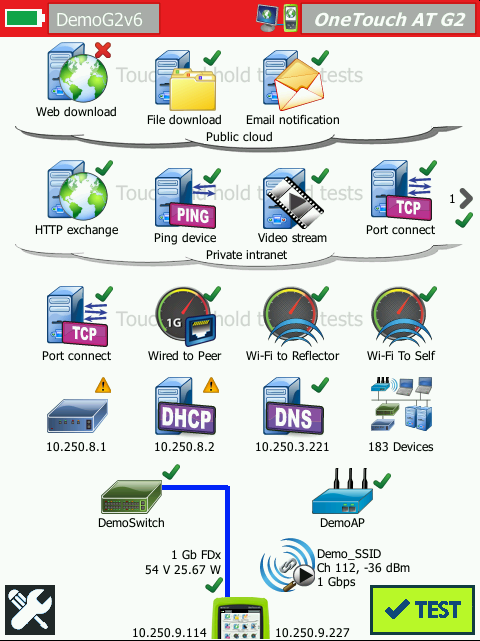 A few examples: ping your WLAN controller, connect to port 2000 on your VoIP call manager, download a page of an application with a web interface, upload or download a file from a server, subscribe to a multicast group, access video content from an on-demand streaming video server or email a text message to your mobile phone. Understand the performance of network services and server-based applications wherever they are hosted: locally in the datacenter, on a corporate intranet server or on a server reached via the public internet. Create location centric AutoTest profiles by grouping together co-located services and applications. Measure service levels to the different groups to quickly spot problems. The OneTouch AT offers periodic autotest capabilities via the Link-Live cloud service. 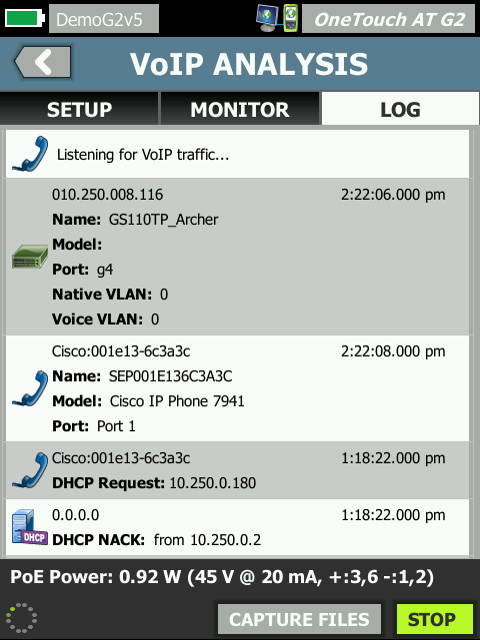 These snapshots in time will help you troubleshoot sporadic network issues. 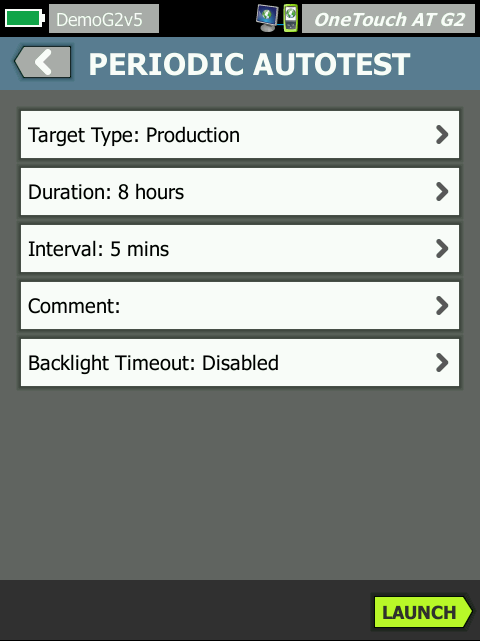 Once the OneTouch AT is connected to the Link-Live Cloud service, both wired and wireless network connectivity test results and report from the Autotest can be automatically uploaded to the dashboard for project management and reporting. This cloud-hosted service is available from anywhere at any time using any device with a browser and an internet connection. It is especially useful for managers of remote teams that need visibility to test results instantly. 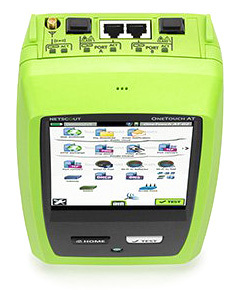 In addition, teams that utilize the AirCheck G2, the LinkSprinter or LinkRunner have a single dashboard system to manage results from network connectivity tests as all these Handheld Network Tools connect to the Link-Live cloud service. Use the built-in RJ-45 management port or optional USB Wi-Fi adapter to remotely control the OneTouch AT and access saved files. Any action that can be performed directly on the OneTouch AT using the touch screen can be performed remotely using a PC, laptop, tablet or smart phone. Minimize the time, expense and inconvenience of traveling to the client location where the problem was reported. Webcam support enables live, remote viewing of the physical environment near the tester. Remote control of units via the Cloud Service also allows traversal of NAT devices, which is very advantageous when troubleshooting from outside the office. 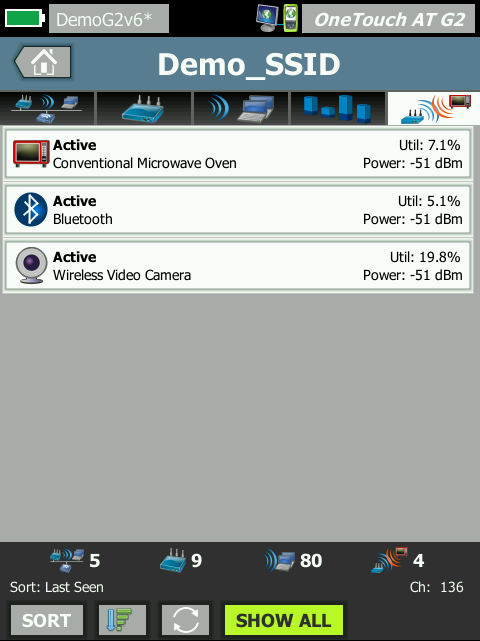 Automatically discover copper and fiber-connected devices and key device properties. Select from among fourteen different sorts to obtain different views into the wired network. For example, sort by IPv4 or IPv6 address to identify used and available addresses. Or sort by switch name/slot/port to understand where on the network devices are connected. Sort by discovered problems to quickly identify potential issues. Additional discovery-assisted analysis tools aid with troubleshooting and profile creation. 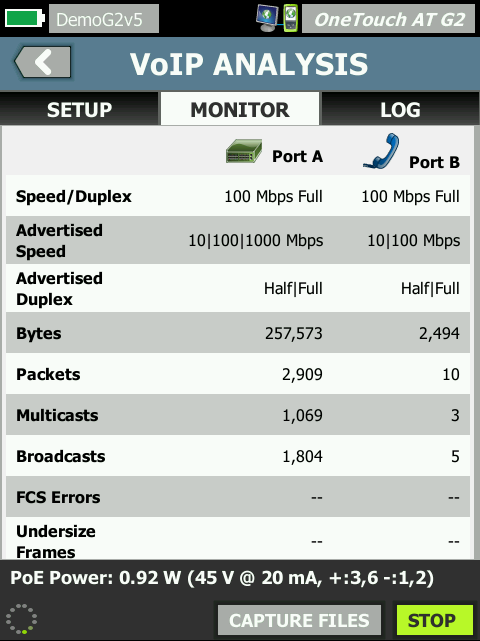 For example, the Multiport Statistics tool provides visibility into switch, router and AP port statistics including speed, duplex, slot, port, VLANs, host count, utilization, discards and errors. 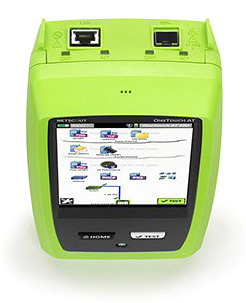 The Devices on Port tool provides visibility into the devices connected to an individual switch port. 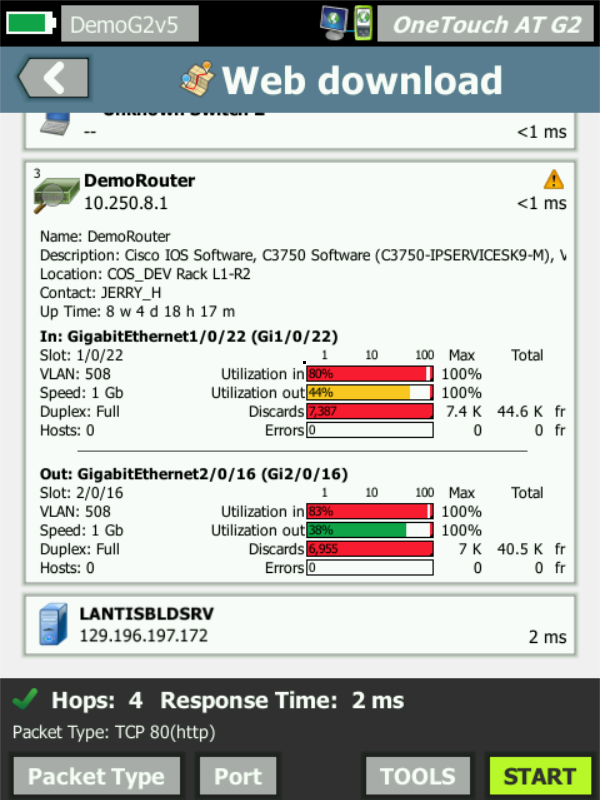 The Path Analysis tool provides a layer 2 and 3 trace route from the OneTouch AT to a target device including time to each hop and SNMP switch and router port statistics. Automatically discover Wi-Fi devices and key device properties, including new 802.11ac access point and clients. Select from among nineteen context-relative sorts to obtain different views into the wireless network. 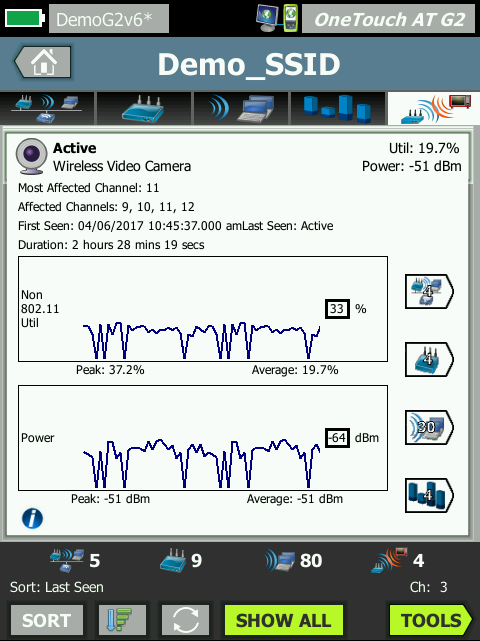 For example, sort by signal strength to troubleshoot Wi-Fi coverage issues. Sort by MAC manufacturer to discover Wi-Fi devices by type and to understand how they are connected relative to SSID, AP and channel. Sort by channel to identify channel spacing and usage problems. Sort by authorization status to find potential security violations. Additional discovery-assisted analysis tools aid with troubleshooting and security enforcement. If a Wi-Fi device is also discovered via Wired Analysis, the Cross Link feature enables one-button toggling between wired and Wi-Fi analysis views. Ensure that newly installed or upgraded wired and Wi-Fi networks meet SLA objectives and are ready for new high-bandwidth applications by measuring end-to-end path performance. Measure throughput, frame loss, latency and jitter between a local OneTouch AT and a remote OneTouch AT peer or a remote LinkRunner reflector. A remote peer provides upstream and downstream results while a remote reflector yields round trip results. Measure performance at rates up to 1 Gbps on copper and fiber networks and 600 Mbps on Wi-Fi networks. A special use model exists that enables testing from the OneTouch AT wired interface to the Wi-Fi interface on the same instrument for testing without a remote. 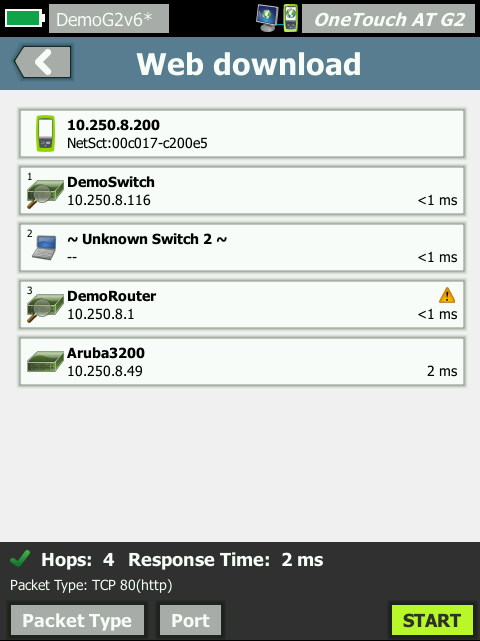 Connect the OneTouch AT inline between an IP phone and the network for real-time troubleshooting and analysis. The VoIP analysis test reveals issues related to PoE, DHCP, TFTP, SIP, and SCCP. The test provides visibility into unencrypted SIP and SCCP traffic to debug VoIP phone problems and quantify the quality of a VoIP call. 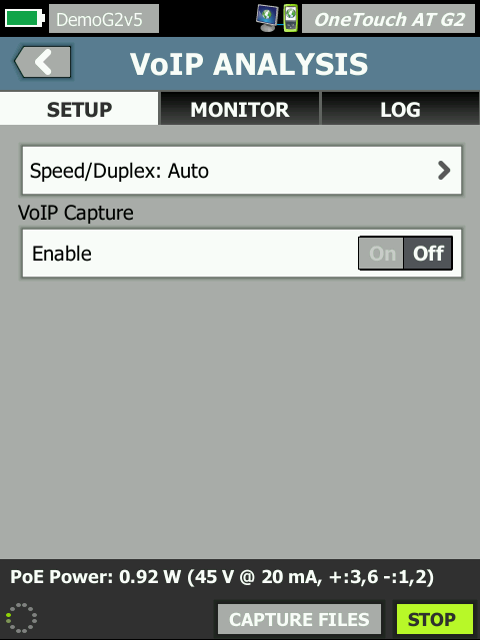 Simultaneous capture of the VoIP conversation is optional. Capture wired, Wi-Fi, VoIP and AutoTest traffic when a packet-level view is required to solve a complex network or application issue. Filter the traffic to capture what is most important. Export the capture file to a PC for decoding and analysis using protocol analysis software. Capture wired traffic on a single port, on two ports aggregated, or inline between a client device and the network. Inline capture avoids the complexity, time and cost associated with standalone taps or configuring switch mirror ports. Capture Wi-Fi traffic by channel and mode (20 MHz or 40 MHz+). Copper and Fiber Optic Cable Testing - Troubleshoot cable performance quickly by measuring twisted pair cable wiremap and length. Use cable identifiers and IntelliTone™ toning to locate and identify cables. Measure the optical power received through fiber optic links. Verify the cleanliness of fiber optic connections by viewing connector end faces with the optional FiberInspector™ USB video probe. PoE Testing - Verify the successful delivery of PoE with the TruePower™ load test. 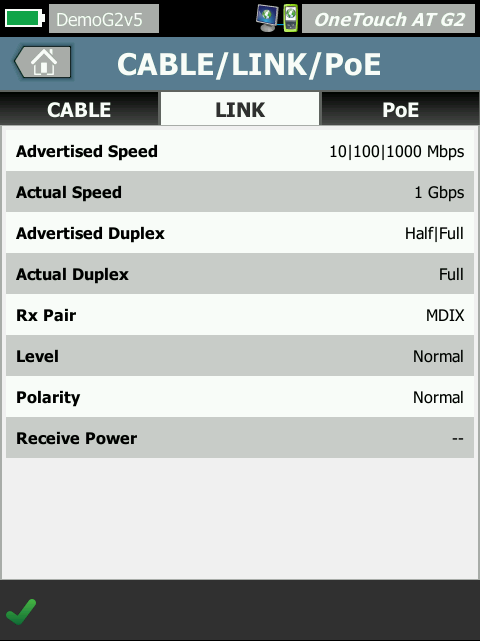 Emulate an 802.3at (PoE+) class 1-4 powered device and measure power up to 25.5 watts. See the requested and received PoE class, the pair used and the PSE type. Measure PoE voltage unloaded and under load. Wired and Wi-Fi Connectivity Testing - Understand how a client device connects to the wired infrastructure by testing link negotiation, identifying the nearest switch, and monitoring key switch port statistics. Understanding of how a client device connects to the Wi-Fi infrastructure by testing the link between the client and the nearest access point, identifying the AP name, channel and security type, observing the authentication and association process, and monitoring key AP and network statistics, including roaming details by AP. 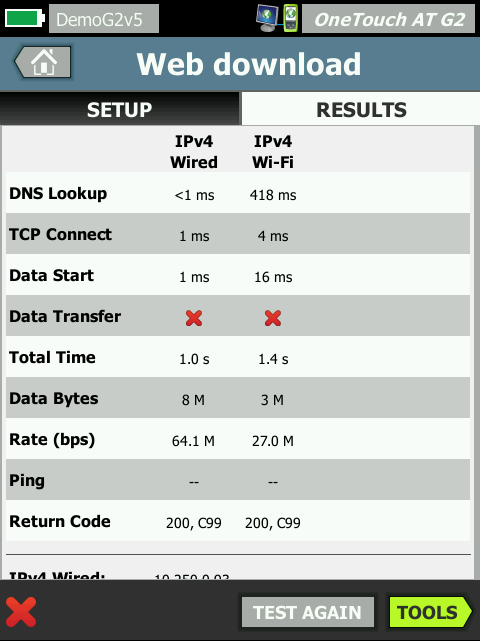 Troubleshoot your IPv6 Network - Easily compare and contrast IPv4 and IPv6 wired and wireless network performance by viewing test results side-by-side. Save Test Results - Save the test results in a report to share with colleagues or outside parties. A report serves as trouble ticket documentation, as a record of historical performance for benchmarking or as a certification report after new infrastructure deployment and turn up. Define which test results to include in the report (AutoTest, Wired Analysis, Wi-Fi Analysis, Tools Settings, VoIP Analysis) and the report format (PDF, XML). Open the results in a spreadsheet for flexibility in results analysis. Purpose-built for Field Testing - The OneTouch AT is engineered specifically for network support professionals on the go. Useful test and management tools include a web browser, Telnet/SSH client, cable toner, webcam support and optional fiber optic connector inspection camera. The durable platform provides years of reliable operation in tough environments.